Day & Night Projects is pleased to present FANTASY: a collective of artists who utilize various modes of painting, installation, sculpture and video to depict delusions within perspectives and interpreting reality. The exhibition will run from Aug. 24 to September 16, 2017, with an opening reception set for Thursday, August 24, from 7pm to 10pm. 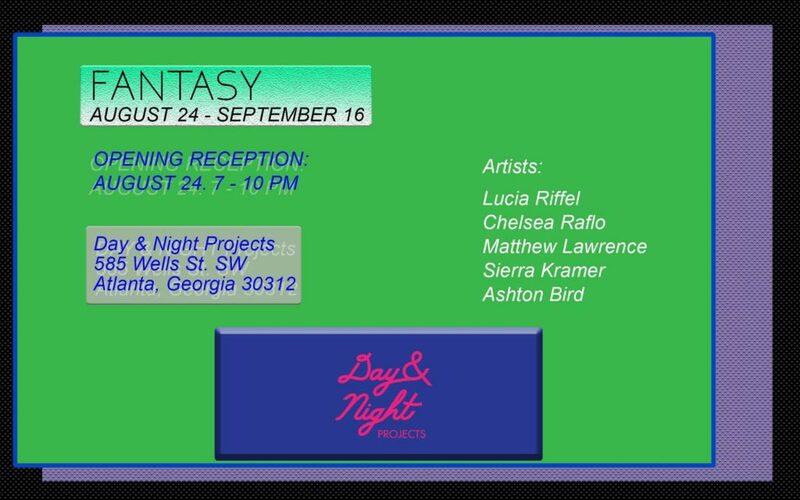 FANTASY features art by FSU Art students and alumni Ashton Bird (MFA ’18), Sierra Kramer (MFA ’17), Matthew Lawrence (MFA ’18), Chelsea Raflo (MFA ’17), and Lucia Riffel (MFA ’18). Lucia Riffel makes work that wavers between digital, physical, and psychological space. Riffel is fascinated by spaces and things that simultaneously exist infinitely and not at all. Where does the internet go when we aren’t looking? Where do we go when we are looking? She is interested in where we are when we are lost in our phones, and how we experience such real things every day that don’t physically exist. Projections and looping animations create experiences that physically exist temporarily, but cycle on endlessly beyond the technological glow. Chelsea Raflo’s current body of work is an installation of mixed-media mobiles that express fragility and stability in equal measure. She is drawn to the kinetic energy of suspended objects and the negotiations of balance that result in simple, elegant arrangements and vulnerable shape relationships. Sierra Kramer depicts heartfelt memories from her childhood, her work seeks to evoke an emotional and imaginative experience from the viewer. Sierra’s tremendous nostalgia for simpler times, memories of constant love and protection assist in the creation of enveloping interactive installations that initiate the viewer to daydream. FANTASY can be viewed at Day & Night Projects Wednesday, Friday and Saturday 11am to 5pm, or by appointment.